Contributions to OAfrica, a tax-exempt organization under Section 501(c)(3) of the internal Revenue Code, are deductible for computing income and estate taxes. OAfrica depends on the generous donations of individuals and corporate sponsors to help us carry out our work. We make it easy to donate securely through Network for Good or Paypal. Just click on one of the links below to set up your payment. *Please note, OAfrica is formerly known as OrphanAid Africa, and therefore this name will appear on your receipt. Thanks for your support! You can download our donation form and send it with your check. Click here if you are looking for the address of another OAfrica branch. To make a bank transfer to another OA branch in France, Germany, Ghana, Italy, Spain, or Switzerland please click here for more information. After providing for loved ones, donors may want to consider leaving a portion of their estate to OrphanAid Africa, either to benefit its unrestricted fund or to benefit a particular charitable purpose or a field of interest. A charitable bequest is one of the easiest ways to make a lasting gift. A bequest to our organization can easily be made through a simple designation in a will or trust. A charitable bequest can dramatically reduce estate and inheritance taxes. Because a bequest to OrphanAid Africa allows for a charitable deduction, and because combined federal and state taxes can exceed 67 percent of the estate, bequests typically generate tax savings that can be passed on to a donor’s heirs. A bequest becomes a permanent legacy that will serve the community for generations to come. OAfrica’s administrators will ensure that donor’s wishes will continue to be carried out as long as it is possible to do so. Please contact us at usa@oafrica.org to find out more. You shop. Amazon gives. 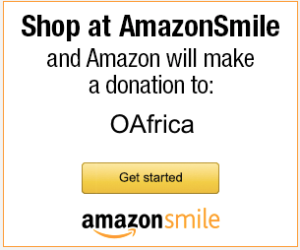 AmazonSmile is a simple and automatic way for you to support OAfrica every time you shop, at no cost to you. When you shop at smile.amazon.com, you’ll find the exact same low prices, vast selection and convenient shopping experience as Amazon.com, with the added bonus that Amazon will donate a portion of the purchase price to us! Click below to get started.